CRUD operation With Gii and The Yii2 Framework. What is Gii? Gii is an incredible piece of software that is part of the Yii Framework. 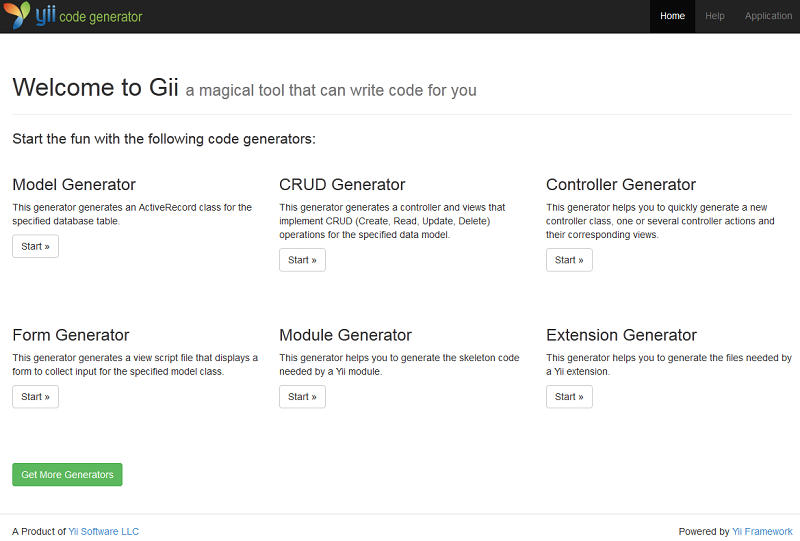 It is a wonderful tool that writes code for you. So many of the development requirements of web applications in PHP include repetitive code, which is why we have these frameworks in the first place. The Gii tool takes it a step further, and creates the code needed to power Create Read Update and Delete functions, new Active Record Models, new Controllers, Forms, Modules, and extensions. It really is incredible. If you have been following along so far in this Yii Tutorial Series, you already have Gii installed and you’re ready to go. Let’s check it out. Like we mentioned, if you created a project along with us, you already have Gii installed. Visit the following URL to check. The code that enables this is found in config/web.php and web/index.php. Now we can create a new model using Gii. First up, we need a table to work with. 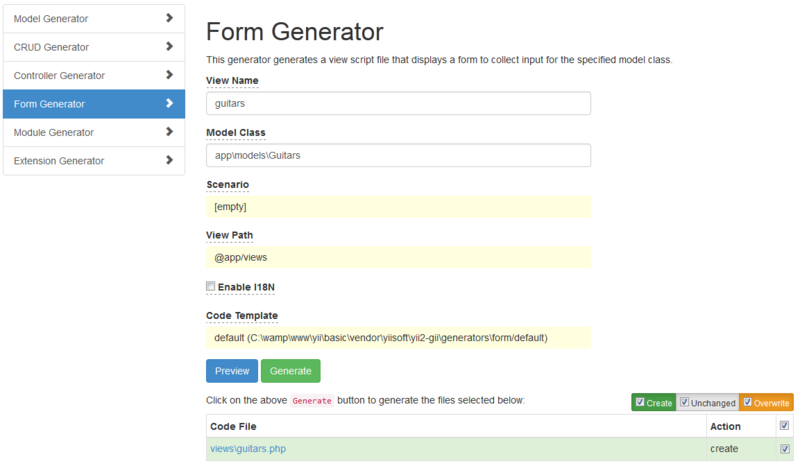 We’re going to create a simple no nonsense database table that will hold information about guitars. It will have an ID field, brand, and model. Here is the code to generate that new table. Now that we have our table, we’ll choose the option to generate a Model in the Gii tool. Note that you provide the exact name of the table to generate a model for in lower case for the table name field. The Model Class will be the exact same name with just the first letter in uppercase. You must follow this convention. We will uncheck the option to generate relations on this first pass through, since we don’t have any. This is just a plain vanilla table with 3 basic fields. * This is the model class for table “guitars”. Awesome! We did not write even one line of code, all we did was tell Gii the name of the table, and now we have a fully functioning Model. One thing that will throw a few people off no doubt is the conventions of having use statements at the top of the controller file versus referencing the full namespace path then instantiating objects. Note the code we listed above used the second approach, but having use statements is a little more clear. We’ll create our controller as such. Do note that if you get an error such as PHP Fatal Error – yiibaseErrorException Class ‘appcontrollersYii’ not found this just means you forgot to include use Yii; in your namespace declarations, so make sure to include that like you see above. At this point, we should have a functioning model, view and controller. Since this is an instance of ActiveForm, it will also have that super slick client side validation included as well. We can test it out by loading up the controller/view association. We’ll submit several guitars too. After we insert a few guitars, we can check out the results by looking in our database to be sure they took. Oh Yeah – It’s working perfectly. So far we’ve been doing the code generating in a somewhat piecemeal way. With Gii, we can do an entire CRUD scenario for tables in our database. In this go around, we’ll create a drums table and let Gii create the entire setup for us. 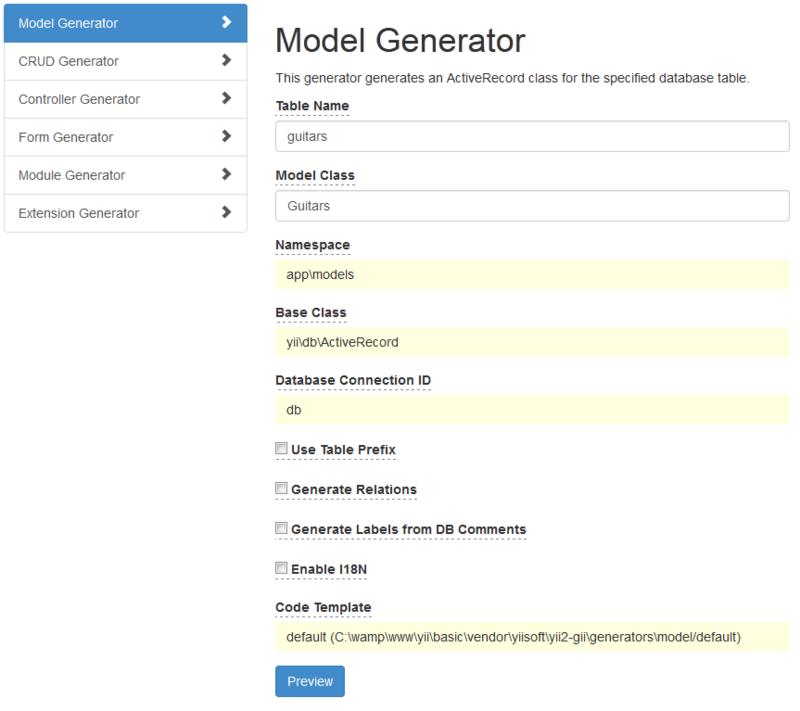 You must create the Model for your table before you can run the CRUD generator. In this case, proceed exactly as we did with guitars, just use drums instead. 4. Enjoy Fully Functional CRUD! Wow! This should give you an idea of the power contained in Yii and it’s code generation tool Gii. All you need is a properly defined database table, and Gii will generate the entire CRUD infrastructure needed to give you a base functioning application. Super impressive. In the prior section, we saw how easy it was to create the full suite of crud functionality with Gii. All we did was create a database table, use Gii to generate a model, then used Gii to generate the entire crud code. Let’s look at the code generated so we understand how it works. This is necessary since the next step in working with and creating Yii applications is to customize the generated code by hand to meet the requirements for your website or application. See if you can understand exactly how these files interact. If you are familiar with the Model View Controller paradigm, it should be fairly straightforward. * This is the model class for table “drums”. 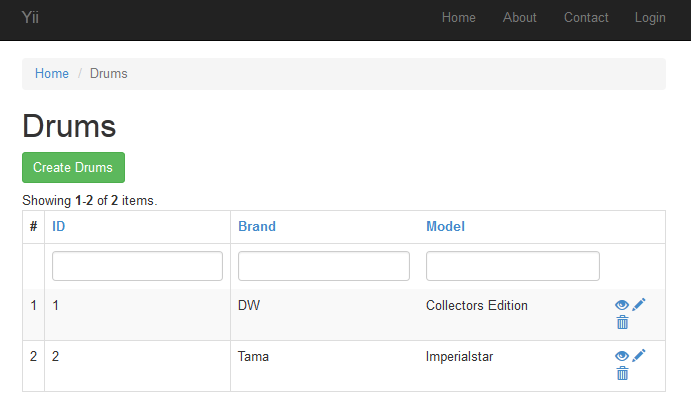 * DrumsSearch represents the model behind the search form about `appmodelsDrums`. 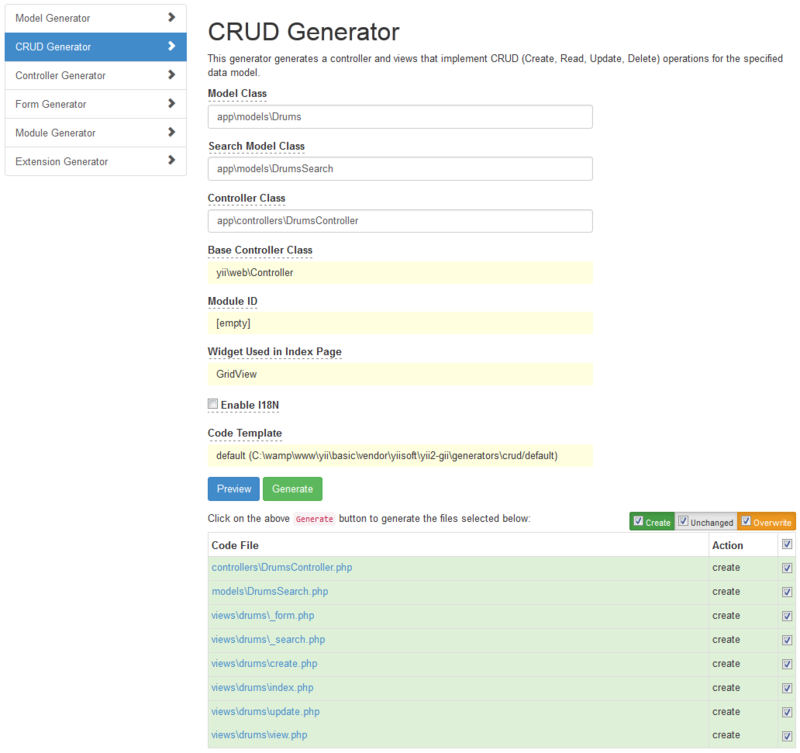 * DrumsController implements the CRUD actions for Drums model. * Lists all Drums models. * Displays a single Drums model. * Creates a new Drums model. * If creation is successful, the browser will be redirected to the ‘view’ page. * Updates an existing Drums model. * If update is successful, the browser will be redirected to the ‘view’ page. * Deletes an existing Drums model. 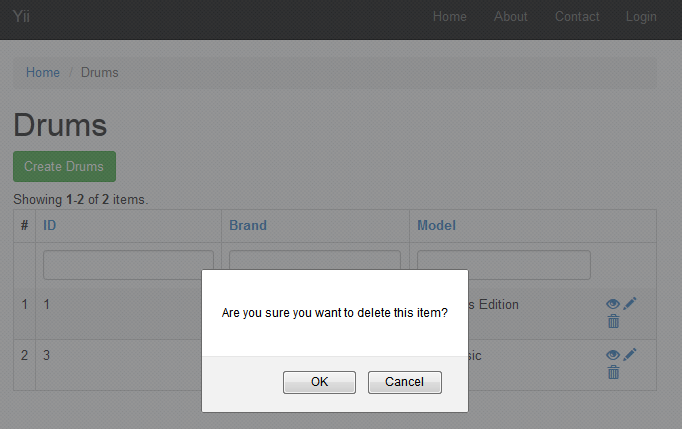 * If deletion is successful, the browser will be redirected to the ‘index’ page. * Finds the Drums model based on its primary key value. * If the model is not found, a 404 HTTP exception will be thrown. In this episode we checked out the awesome Gii Code Generation tool which is a part of the great Yii 2 Framework. We learned that by simply providing some basic information to the tool, along with a valid database table, it will create all the code we need to interact with that data. How to integrate the Google Cloud Messaging in PHP? How can I integrate the new Google Cloud Messaging in a PHP?